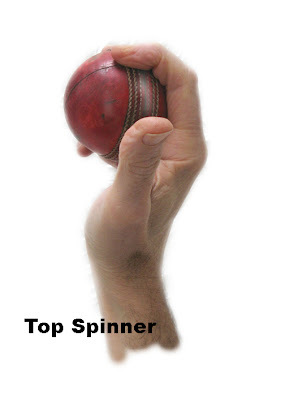 The Top Spinner probably the most basic and least problematic of the lot and potentially a very useful tool in learning some of the other variations or at least a starting point with regards putting some of the theory into practice. This delivery is a forward spinning ball with the seam aimed directly at the batsman. On impact it bounces more than expected and shouldn't deviate off it's incoming line after making impact with the wicket. The desired effect is that the bounce catches the batsman off guard and glances off either the gloves or the top edge of the bat and ends up with a catch being made. The batsman sees the hand viewed from the side with the thumb leading the hand as the hand comes over the head. My personal experience with this ball is that this is the one that allows easiest flick action of the wrist. Other observations are that if you're concentrating on learning how to bowl a good line and length this is the ball that could be instrumental in facilitating this process. With no need to try and do anything tricky with the seam e.g. make it come out of your hand with the seam rotating sideway (Leg Break & Wrong Un) you can bowl straight unhindered again and again just tweaking your delivery until you find the right feel. After a lot of bowling you'll reach a very satisfying point when your accuracy comes to you. The top spinner with its forward spinning characteristics is potentially the ball that drops out of the sky the most dramatically as it’s not subjected to any side spin as the Wrong Un and Leg Break are? It’s here that I have to concede that my lack of experience means I can’t confirm this as it’s not something I’ve observed or had a batsman come back to me and mention. But reading about spin and the Magnus affect it makes sense that this ball is potentially the one where this comes into play the most? Again, the effect would be the batsman would see the ball released and it would begin it’s trajectory through the sky and he would calculate it’s expected path based on experiential information – the entry trajectory would be mirrored with a slight decrease by the exit trajectory out of the bounce off the track. Henceforth with the top-spin the ball suddenly dips rapidly out of the sky and in doing so with the forward spin then bounces far more than expected because of the sudden increased angle of entry into the bounce. The effect is the ball bounces far higher than expected and comes off the top of the bat or the gloves for a catch. As far as I know a well delivered Top Spinner doesn’t particularly produce drift because the rotation of the seam is upright. But in the same way that an outswinger or an inswinger is affected by the surface of the ball e.g. one side is shiny and the other not as shiny there's the potential for the ball to swerve through the air as a result of the rough side causing friction against the air. Similarly if the ball is bowled with a slight emphasis with the wrist towards the Leg Break or Wrong Un position on an un-responsive track the affect may be a dead straight non-turning ball with the Top Spinners bounce but the accompanyment of drift through the air. At club cricket level one of the best passages of play I’ve ever seen was a spell by an older bloke in his late 50’s bowling primarily Top-Spinners. The team were short of bowlers it seemed and between 4 blokes they had to bowl 50 overs. This bloke bowled 13 of them and got 10 maiden overs. I didn’t see his initial overs and I can only assume that at some point he got one or two of the balls to turn because when I picked up the spell he had the batsmen tied down and he was into his Top-Spinners. The batsmen were two of our openers, cricket players of many years (In their 40’s) on our own wicket and yet this bloke was had them fixed to their respective ends playing defensive shot after defensive shot. The only ball I could see that he was bowling was a Top Spinner. After the match I asked our bats ‘What was going on out there’? and they said "There was nothing we could do he was so accurate and was bowling different lengths, different speeds and different flight all of them on the stumps meaning that you had to play the ball.